It’s taken almost 20 years, but I think I finally have a handle on one species of the looping genus known as nalbinding (or nalebinding, or naalbinding…). Last weekend I traveled to Iowa to Vesterheim, the national Norwegian-American Museum, for a 3-day class in their Folk Art School with Kate Martinson, an Emeritus Professor of Art at Luther College in Decorah. Over the years, I tried to teach myself from books. I’ve learned other things from books and perseverance (including netting). But with nalbinding, I never got very far. By the time video instruction came along, I had myself psyched out and confused to the point where I made very little progress. So when this class came up at a time when my calendar was clear, I decided to go for it. And I’m so glad I did. The class progression allowed time for the kind of repetition it takes for me to really get something like this. I made sufficient mistakes to work through to develop my understanding of the structure. 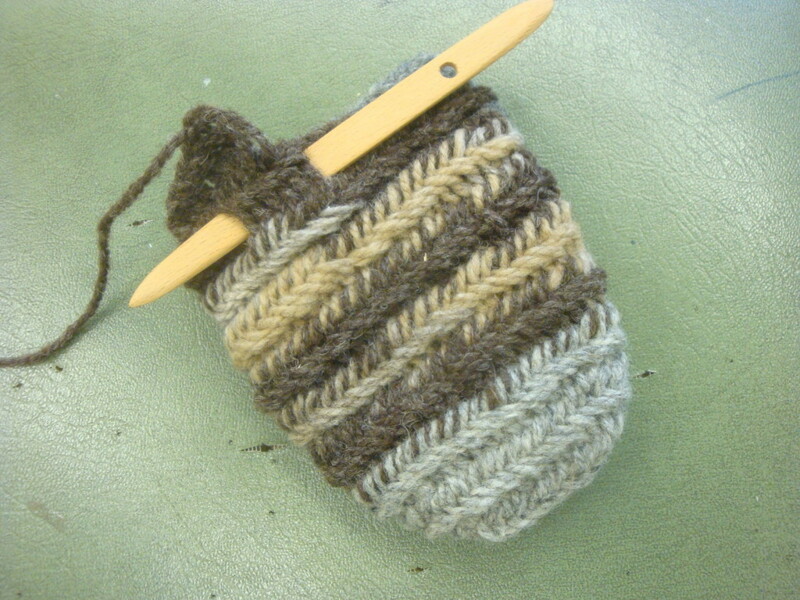 And by the third day of the class, I was actually seeing the structure of the Broden stitch. The picture above shows only a fraction of the starts I made. When I left, it was with confidence that I can not only keep going but also start chain, oval and round elements without too much angst. 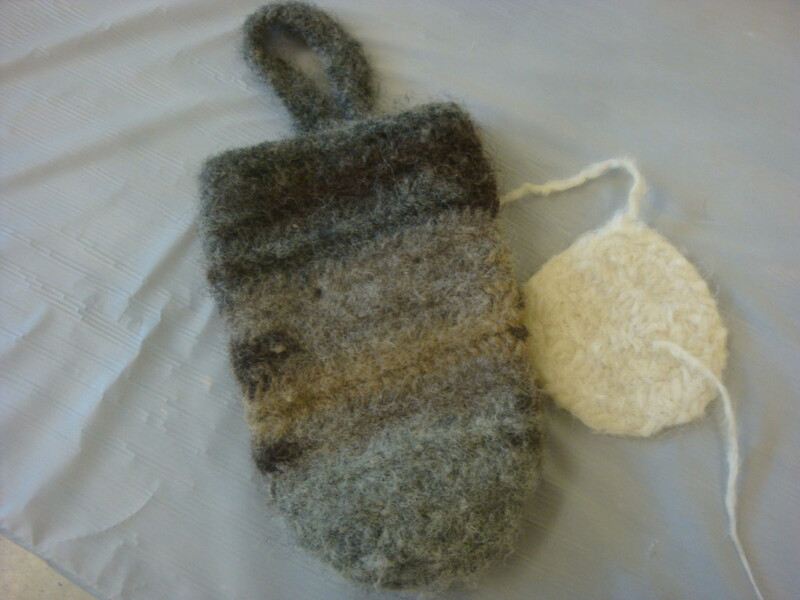 And Kate made oval starts for students’ practice projects, so I was able to get a pouch done in time to learn some very cool tricks for fulling the wool. 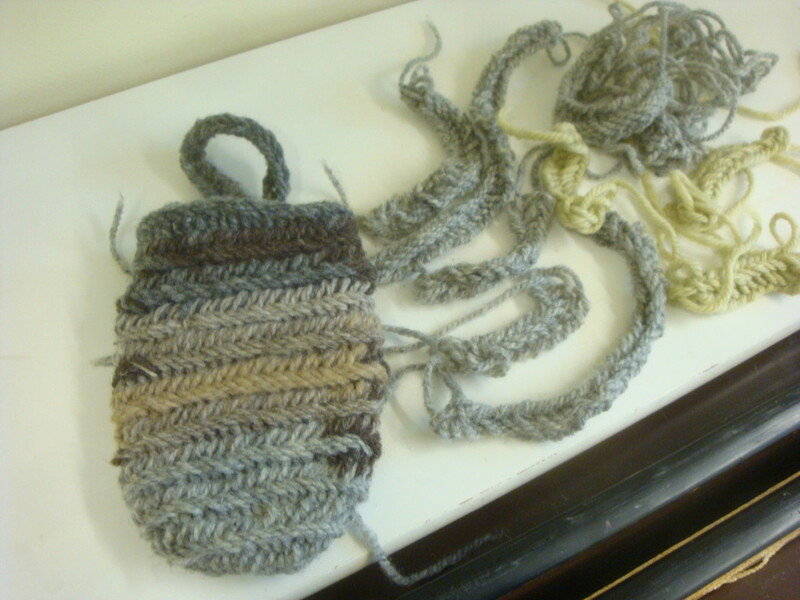 The class also included a guided trip through the museum, a field trip into the collection with chief curator Laurann Gilbertson, and a field trip to the local yarn shop, Blue Heron Knittery, where I learned a lot about choosing yarn for nalbinding. I was so focused on learning and having fun that I didn’t take many pictures to show what a great weekend it was. Everyone in the class was delightful, everyone from the museum was helpful and so pleasant, and the classroom had great lighting, plenty of space and a comfortable area outside for lunchtime visiting. I saw some familiar faces and made new friends in class, and enjoyed spending quality time with the friends I stayed with while in Decorah. And after 20 years, I think (and hope and pray) I’m over the hump in learning this amazing looping technique. Repetition and minimal distractions during more repetition is just what I needed. I’m getting there, and think I might be ready in a few months for some additional variations you might be teaching, Andrea!